Zimbabwean first lady says "no vacancy" to leadership "successionists"
VICTORIA FALLS, Aug. 16, 2014 (Xinhua) -- Zimbabwean President Robert Mugabe (L) greets leaders from Southern African Development Community nations at Victoria Falls in Victoria Falls, Zimbabwe. 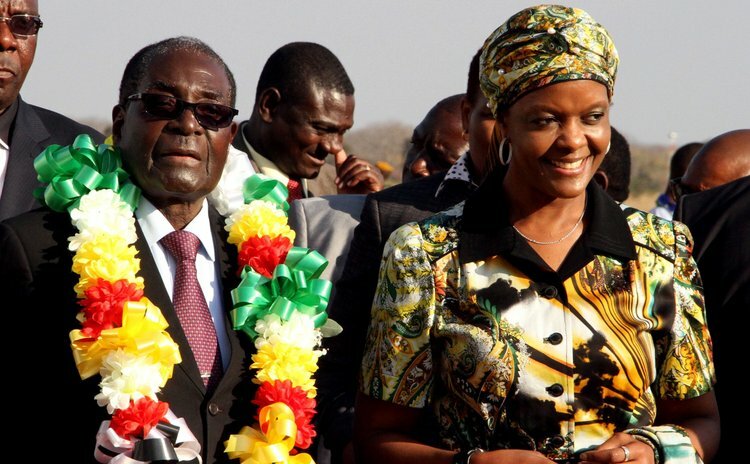 HARARE, (Xinhua) -- Zimbabwean President Robert Mugabe's wife Grace Mugabe on Friday warned those aspiring to take over from her husband that there was no vacancy before God ordains his retirement. At a rally in Buhera North, Manicaland Province, the first lady lashed out at perceived factionalists and successionists in the ruling Zanu-PF party who were bent on toppling her 93-year-old husband. Mugabe's tenure as party leader ends in 2019, but the party in 2014 had endorsed him as its presidential candidate for the 2018 elections. "Whoever is engaging in factionalism must stop forthwith, stop it," she bellowed to thousands of people that included school children. Vice-President Emmerson Mnangagwa is seen as the face of "successionist" politics but he has since denied harboring ambitions to take over from Mugabe before his tenure ends. The first lady challenged the "successionists" to self-introspect and determine whether they possess leadership qualities and are able to emulate her husband. She added that her husband was irreplaceable and even if he contested the election as a corpse the people would vote for him. "When God finally decides that he should leave office, then you can also enter the fray. (Until the moment) there's no vacancy," she said. Mugabe, who has been in power since Zimbabwe gained independence from Britain in 1980, is the world's oldest leader. The first lady also donated food, clothes, laptops and exercise books to the gathering in her first leg of tours to drum up support for her husband in the 2018 general elections.